Mary Ann Paolantonio was born and raised in Melrose Park. She is the daughter of Silvio and Carmella Paolantonio. Her maternal grandparents, Michael and Anna Maria Branda, came to Melrose Park in 1915. Mary Ann and her two brothers grew up in her grandparent’s first house… and 100 years later, it still remains Mary Ann’s home. Mary Ann attended Our Lady of Mt. Carmel School and graduated from Mother Theodore Guerin High School (now Guerin Prep) in River Grove. She earned an Associate’s Degree in Business Management from Triton Community College and was a member of the Phi Theta Kappa Honor Society. In 2003, upon receiving a merit scholarship from DePaul University, Mary Ann decided to continue her education. She pursued her studies part-time, while continuing her public service work. In 2008, Mary Ann was awarded a Bachelor’s Degree with honors in Pre-Business Law. Mary Ann is proud to serve the community she has always called home. In 2001, Mary Ann became the Village’s youngest female to be elected Village Clerk. During this time she served as Chairperson of the Village’s American Cancer Society’s Annual ‘Relay for Life’ for 9 years, Chairperson of Mayor Ron Serpico’s U.S. Marine Corps ‘Toys for Tots’ Drive from 1997 to the present, Local Chairperson for U.S. Census in 2000 & 2010, and spearheaded the Village Clerk’s ‘Coat & Vote’ Coat Drive. Mary Ann is a member of the Municipal Clerks’ Association and League of Women Voters. Mary Ann is very involved with charitable and not-for-profit organizations. Her early involvement began over 20 years ago when she volunteered for the Missionary Sisters of St. Charles Borromeo, Scalabrinians. In the Sister’s Guild, Mary Ann has held many offices, including Past President and has served as Chairperson for both their fundraising events – ‘St. Joseph Table’ and ‘Person of the Year Award Dinner. Every year Mary Ann continues her family’s 92-year tradition of the Branda Family Candlehouse being part of The Shrine of Our Lady of Mt. Carmel’s Feast procession. In 2005, the Our Lady of Mt. Carmel’s Feast Committee honored Mary Ann with the ‘Woman of the Year’ Award for her dedication to the community. Children’s Home, Melrose Park Sports and Benefit Fund, and The Nechahual Foundation. Mary Ann’s outreach also extends to the local business community. 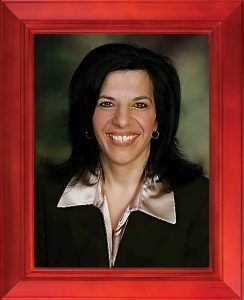 She served as President of the Melrose Park Chamber of Commerce from 2006 to 2007.